Editor’s Note: On the wall of my study is a photo of a painting. Its theme is a flower vendor and her family working. The woman in the center is playing with the fingers of the naked baby she holds while the grandma in the background gathers torch ginger. Little girls sit on either side of their mother holding a calla lily and a stalk of torch ginger. The painting is filled with brilliant hues of pinks, blues, oranges, and lavenders; yet the emotions of each character are what captivate my attention more than the lovely colors. It appears to me anyway from the looks in the little girls’ eyes that they may be jealous of the attention mom is giving the baby and would prefer a turn on mom’s lap! Its creator, Julio, is convinced he was born with the passion to pursue art. He has been unwavering in his dedication to its calling. 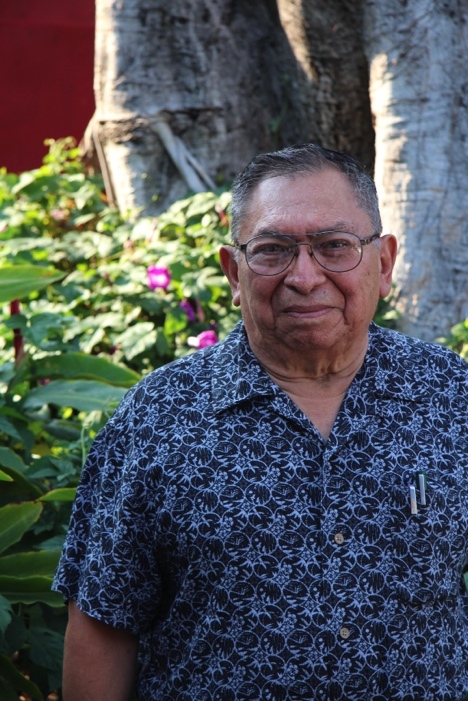 In order to represent the authentic Mayan culture, Julio travels extensively throughout Mexico and all the Central American countries and studies with anthropologists and archaeologists. He is widely recognized worldwide for his contributions in the art world. He came to our interview with a sizable portfolio filled with articles written about him and photos sharing samples of his work. The colors in his paintings are vibrant and bold. The spirit he captures is deep in the soul of his subjects. 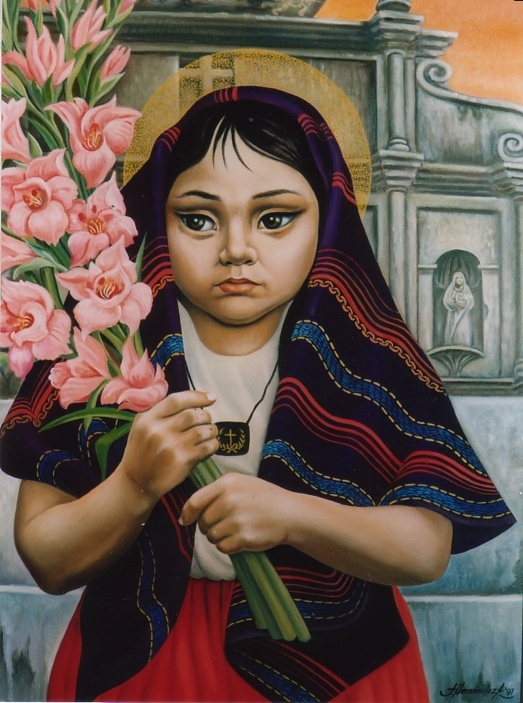 Julio’s art hangs in galleries and embassies throughout the world including Japan, the U.S., Mexico, Guatemala, Paris, Costa Rica, Panama, Puerto Rico, and Honduras. WHEN DID YOU FIRST BEGIN TO SHOW SIGNS OF A TALENT OR INTEREST IN ART? I believe I had a sense of being an artist when I was born (October 1, 1940). As young as four years old I was drawing children. My parents were playing radio news reports of events happening in WW II during the Christmas season when I was five. Our family’s annual tradition was to draw a Nativity mural on our walls. That year my parents gave me the assignment by providing me the colored chalk art supplies. They left the house. Were they ever surprised to come home and find a much different Nativity scene on the wall than they expected. The mural was covered with tanks, bombs, and guns. They didn’t know I had been listening to the news reports also. DID YOU RECEIVE FORMAL ART TRAINING? Yes, my parents recognized my interest and skills and I was fortunate to live two blocks away from the National Art Center that held children’s drawing classes. I began my formal training by taking classes at age nine and continued for five years. My teachers in school also recognized my skills, and I earned my first award at age nine in second grade. The assignment was tied in with the novel Uncle Tom’s Cabin. We were to paint what we read which was supposed to be one drawing. I turned in 25 drawings and won first place at age 10; the prize was the book itself. 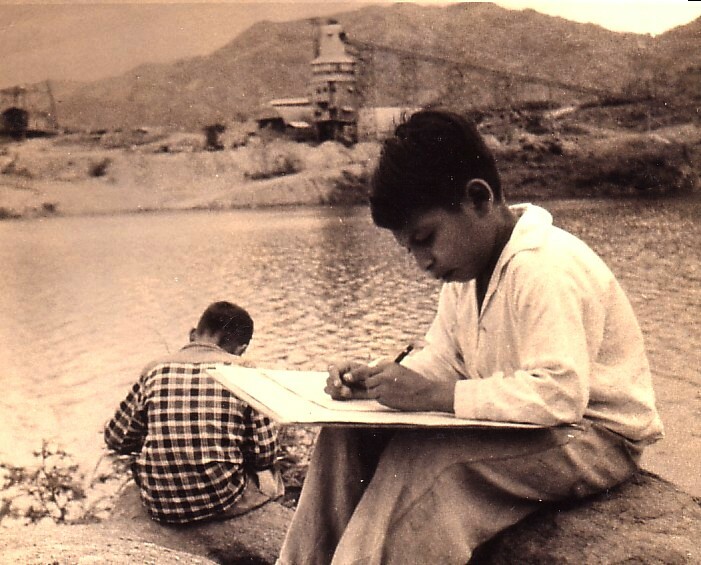 At age 12 I won a UNESCO sponsored contest with the theme, “How do I see my country?” I went to a very high hilly vantage point outside San Salvador, in Panchimalco, to SEE my country but was overwhelmed because it was too huge to paint. Instead I decided to focus on another spot, The World Savior Monument, in the foreground and volcano in the background in another area. I have received numerous awards during my lifetime. IF YOUR PARENTS HAD NOT ENCOURAGED YOUR ART BY PROVIDING LESSONS WHEN YOU WERE YOUNG, DO YOU FEEL YOUR SKILLS AND PASSION WOULD STILL HAVE EMANATED? Actually, my mother died when I was nine and my dad left me an orphan so I was able to spend those first five years studying formally without my biological parents in my life. Artists are often sensitive people who can overcome their tragedies and their grief through their art. I married at age 23, and my wife and I had four children. Our 13 year old died of lung cancer. Two years ago we lost another daughter; and a year and a half ago my wife died. People thought I would be so devastated that I would never again paint. Embassies all over the world hold my paintings, and the U.S. ambassador was so concerned that I would give up my work that he sent me economic help as well as art materials to encourage me to continue painting. I never stopped. When I paint pictures of girls, I use the faces of my daughters as inspirations in my paintings. 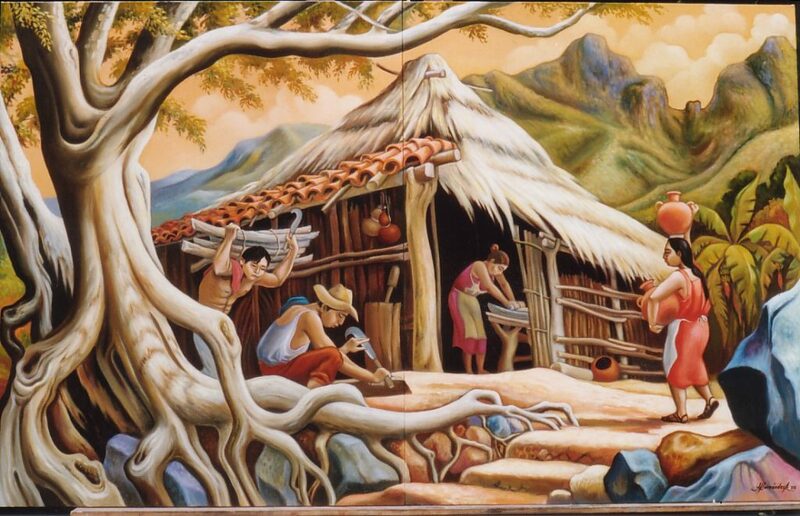 WHEN DID YOUR PASSION FOR THE MAYANS EMERGE AS A THEME IN YOUR ART? When I began studying formal art, we used models to sketch the human body. They were the local campesino people posing for us. I grew interested in the culture of the indigenous people. At age 17 a Swiss man from the World International Organization (OIT) came to El Salvador to study Mayan culture. 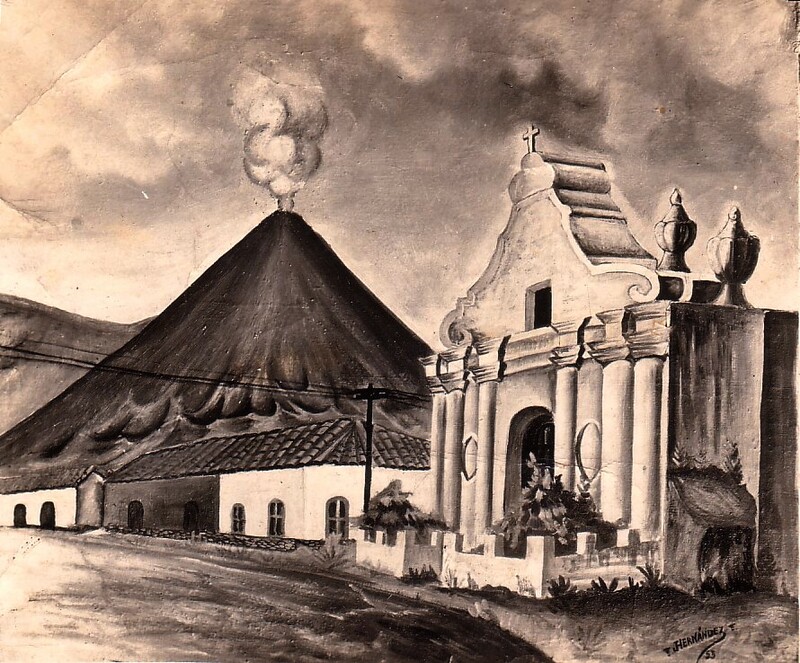 He drew the archaeological designs including pottery requiring much research at the anthropological museum in Mexico, Puerto Rico, and throughout the other Central American countries (Guatemala, Honduras, Costa Rica, Panama). I became involved in this body of work through funding from the government ministry that covers the fine arts. Every year I returned to study in Mexico for three months at a time. I worked in the government department responsible for the arts (theater, music, dance, literature, visual arts). Over time I began to incorporate what I learned into my own art. DID THIS RESEARCH INCLUDE INTERVIEWING INDIGENOUS PEOPLE? Yes, we spoke with surviving Pipil indigenous people near Sonsonate to enrich our understanding of the culture we wanted to preserve. This was also true when traveling to Panama, Guatemala, and Costa Rica. DO YOU HAVE MAYAN ANCESTRY? Probably; we all are Mayan at some point in our ancestral backgrounds. WHAT DO YOU SEE AS THE FOCUS OF YOUR ART? Studying with many teachers from Mexico and Costa Rica had a big influence on me. Art has been in the humanities since the beginning of time. I cannot imagine a world without art. It is a way people all through history going back to the Greeks and beyond preserved their history and culture through their art. All governments throughout the world want to preserve their art because it portrays their history. Preserving the Mayan culture and history is my main focus. I am trying to do that accurately and faithfully for the Mayan culture which is predominate throughout Latin America. I do some private commissioned work, but at some point almost all my work is focused on Mayan culture and preserving our history and ancestry. I find myself wanting to rescue and preserve it. I’m recognized in the country for it. ARE YOU A MAN OF FAITH? IF SO, DOES YOUR FAITH INFLUENCE YOUR ART? Yes, my faith is a big influence on my art much as the Renaissance painters’ works reflected their faith. One can leave a religious legacy through art. I am Roman Catholic but not fanatical. My faith is more of a personal relationship centered around the recognition and power of God. WHAT IS YOUR PREFERRED ART MEDIUM OF CHOICE? Oil paintings. I know and have used all other art media: sculpture, pottery, acrylics, etc. but find I am more comfortable using paints and other media limit me too much. WHAT SPECIFIC SUBJECTS MOST INSPIRE YOUR WORK? Members of the campesino community. You will see “mother and child” being a frequent focus within many of my pieces. Women inspire me more than men. I sell only original work; I make no prints or copies, nor do I mass produce. 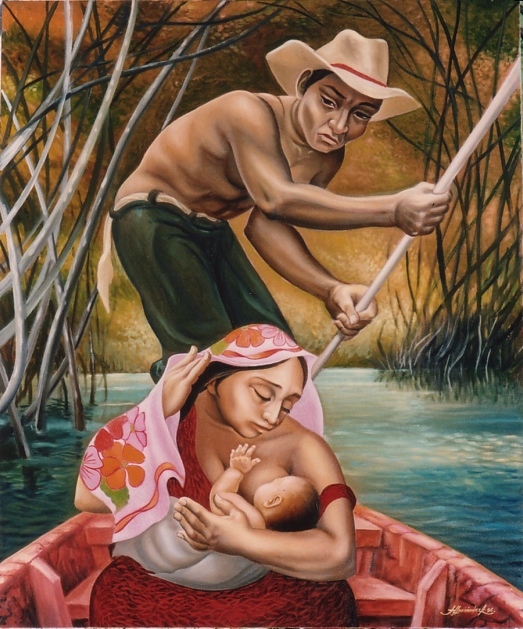 IN YOUR OWN WORK OF CAMPESINO COMMUNITY LIFE, WHAT THEMES DOMINATE YOUR ART? I never repeat anything but tend to work in series. For example, I will do a series on love, a series on humility, a series on campesinos working. BESIDES YOUR RESEARCH FOR THE GOVERNMENT AND YOUR OWN WORK, DO YOU MENTOR OTHERS IN THE ART FIELD? WHAT IS THE SINGLE MOST IMPORTANT ADVICE YOU WISH TO PASS ON TO YOUR STUDENTS? WHERE HAVE YOU DISPLAYED AND RECEIVED AWARDS FOR YOUR WORK INTERNATIONALLY? I am fortunate to have my work exhibited worldwide. The first time my work was on display in Europe was in a Parisian gallery that chose three international artists from around the world. Later French President Francois Mitterrand invited me as part of the 1990 event commemorating Van Gogh’s death. HOW HAS EL SALVADOR RECOGNIZED YOUR WORK? 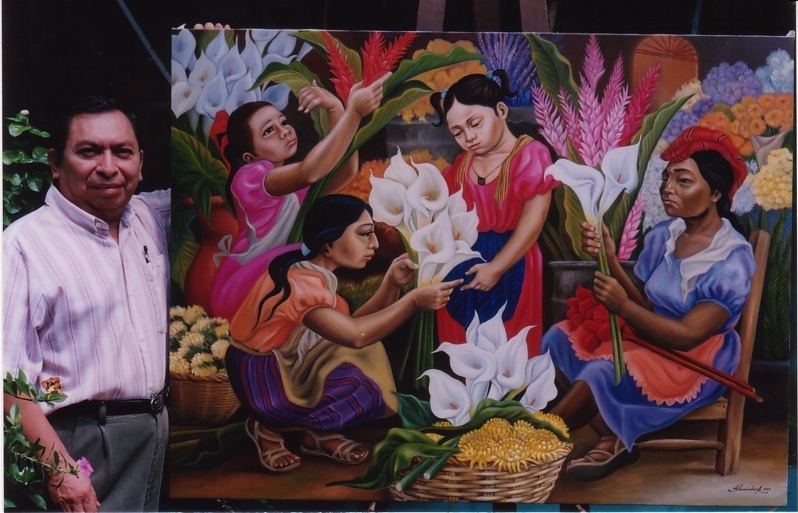 Our Congress chose me to receive an award as the most distinguished painter of El Salvador in 2000. 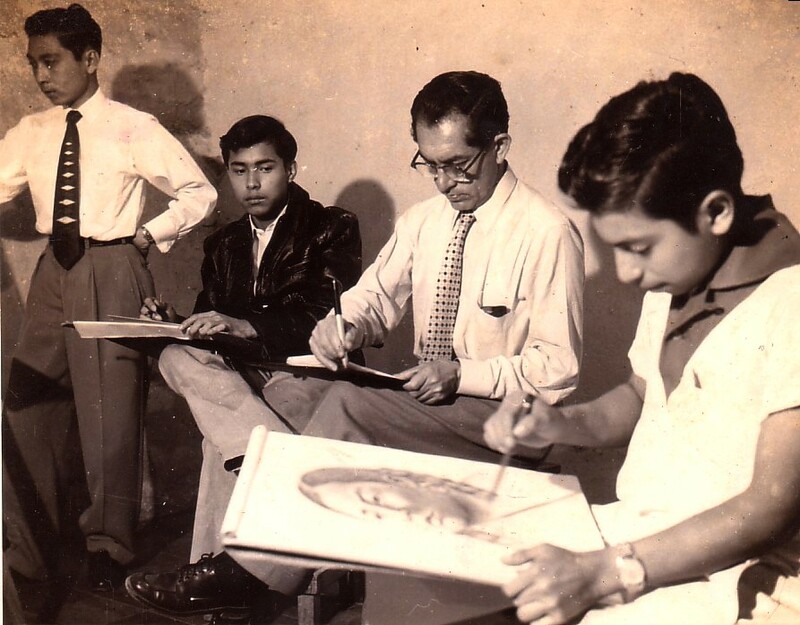 The Ministry of Education gathered art from some leading Salvadoran artists to bury in a time capsule and open in 100 years as part of its legacy. My art is included in that. It is an honor for me because the next generations will know my art. HOW DID YOUR WIFE DESCRIBE YOU? She said I was loving, a good man, hard-working, and very disciplined. Some would say that is because I am a Libra. 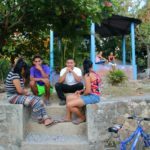 ARE YOUR REMAINING CHILDREN IN EL SALVADOR? I was able to get them into the U.S., and they are professionals. I miss them, but through the U.S. Embassy I was able to get them to a more secure place and am able to visit them. YOU DESCRIBED ARTISTS AS SENSITIVE PEOPLE. ASSUMING YOU INCLUDE YOURSELF IN THAT DESCRIPTION, HOW DO YOU RESPOND TO YOUR COUNTRY’S PAIN AND SUFFERING? I cannot deny the pain and suffering that has been and continues in my country. But as an artist I have a sense of wanting to leave behind a legacy that rises above, ie. is better through my art, that teaches a new generation to appreciate art, that gives them something positive to reach for. HOW WOULD YOU DESCRIBE THE STATE OF THE WORLD TODAY? WHAT WOULD YOU DO DIFFERENTLY IN YOUR LIFE IF YOU HAD THE CHANCE? I would not change anything; I would live the same life. But for an artist that is not enough. I would like to live forever because I have so many projects I still want to do! In a Van Gogh film he returns to life because he still has so many projects to complete. WHAT IS THE BEST DECADE OF YOUR LIFE? Artists want to live in a world of peace without pressure. I am comfortable with my life. I have known love, bitterness, pain, bad and great times. Life has been good to me despite being orphaned at nine. My children have been the most amazing part of my life. I am thankful to have children who understand me. I am happy to know I am contributing to a cultural legacy of my people. I am grateful for your project in preserving stories of the Salvadorans. 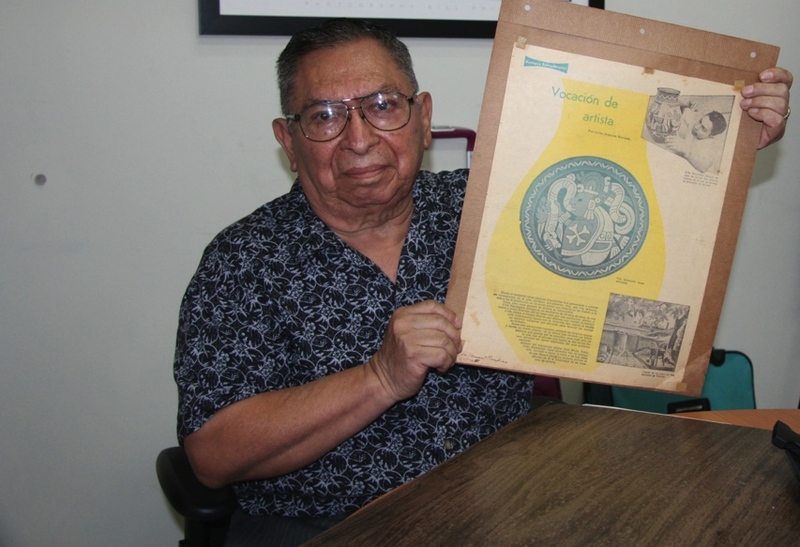 Final Editor’s Note: Julio has been creating art for over 70 years and has no plans to retire. 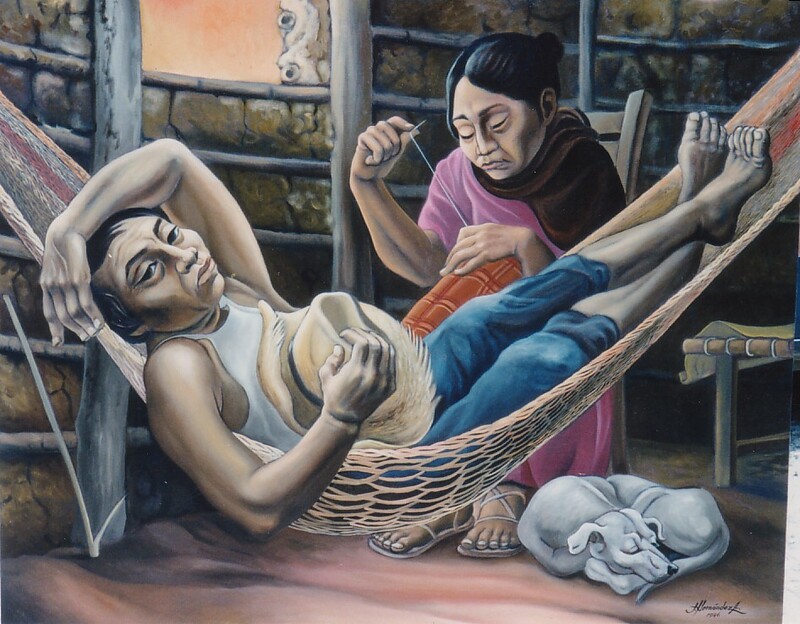 His art is recognizable and unique due to its Mayan theme and technique. More important is Julio’s commitment and contribution to authentically preserving a culture for not only his generation, but future generations. He is generous in sharing his skills and talents by teaching others who wish to learn.